I'm glad I went running this morning. It's been a long day, in and out of sessions and meetings all day on the Microsoft campus. I didn't get to a lot of sessions, preferring to meet with people in the hallways and talk about SQL Server and database stuff. The most valuable time for me is always the time when I get to talk with people and network, building bonds and relationships that will help me in the future. Or maybe will help the other person. Networking is funny that way. You never know if you're giving or receiving more from a person, but it all seems to result in a great synergy to me. Glad I was up early to run as I had to work a bit tonight and am about to head out to the evening reception. Back in Seattle, for the MVP Summit after missing last year's event. And it's raining, who've have thunk it? Wired this morning, had a hard time sleeping and had two beers last night, which was one too many. Still, I got up, ran, and felt a little better. Now time to pack up and head to the Microsoft campus for meetings about lots of stuff I won't be able to talk about for awhile. This is me playing with him on the floor this morning. 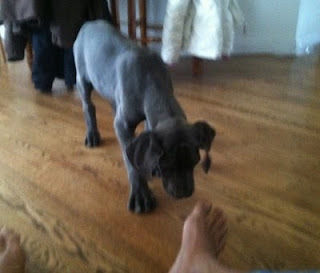 He's a blue Great Dane puppy, about 10 weeks old. 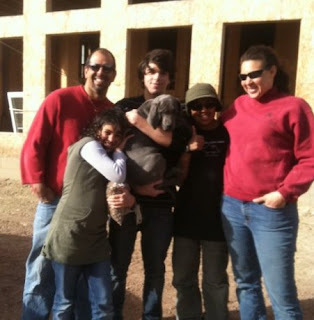 We all drove down to Penrose yesterday to visit a breeder with the intention of checking out their pups. The breeder is also a rescue, and it was amazing to see someone that had devoted their life to these dogs. She's at Penrose Great Danes and has built a few dozen runs on their property with probably 50 Great Danes that she's rescued and breeds some of them. It was amazing to see so many dogs in one place, all so friendly and excited to have visitors. I'll have to post more pictures later from my phone, but there were some amazing ones. We sat down with the two litters that were 10 weeks and looked through them. They were playful and the kids were excited to hang out with them. I wanted to try a male this time, and so I looked at a black, but he was wary of us and that made us reconsider. Kendall really wanted one of the black females, but in the end we went with Junior, a blue male. Here we are getting ready to head home, with Junior in Kyle's arms. It was a long night with the puppy, even though he slept fairly well and I expect that we are in for a few long weeks as we housebreak him, but so far he's doing well and adjusting to the chaos on the ranch. I took the MCM test today, and finished it. I needed the time allotted and it was, well, an experience. I’m glad it’s done as I have a number of other things to work on. I’ll get results in a few weeks and in the meantime, I’ll get permission to see what I can write about the experience. I scheduled a massage today, wanting to get one all week but struggling to find time. Finally I decided today was a good day since I have my MCM test tomorrow and then am out of town. So I crammed in some work, and am cramming in more now to make time to get down there. It felt good while I was there, but when I went to stand up, I was sore. The body definitely felt beat up, and I think the running this week along with karate after almost two weeks off has me really sore and all the rubbing just made me aware of how sore I was. Karate tonight, but then I think I will be looking for some rest this evening. It's amazing what one hour of delay, once a week, can do for your mood. I love the late start Thursdays, the kids love it, and it just makes the morning less stressful. I look forward to that one day a week when I can sleep in a little more. I filled out a survey for the school letting them know, and I hope that they continue it next year. For some reason it seems that Tia has lots of trips that cross maid day. We have someone come every other Wed and clean the house, and once again, Tia's gone and I had to straighten up the house. Typically it's annoying to me. I like having the house clean, but it seems that it's always an inconvenient time when the maid comes and I need to clean up things, put them away, find sheets, etc. However today, despite having a 9am call and being busy, it wasn't that bad. I got most of the house done and didn't miss much work. The house is clean and looking good, laundry almost caught up. Just some trash to gather up for tomorrow and hopefully keep the house clean for Tia to come home to. Tonight were the Order of the Arrow elections for Delaney's scout troop. They do this once a year, and boys have to be nominated by another scout, meet a few requirements and then over half the active boys in the troop need to vote for a nominee. Delaney was nominated and elected tonight and is on his way to becoming an Order of the Arrow member. It's an honor for a Scout, one I never got, and I'm proud that he's adding it to his growing resume of accomplishments. Back to the grind after our week in the Bahamas and my lovely wife is off on another adventure. She left tonight for Atlanta, with a 2 hour meeting tomorrow before going to Columbus, OH for two days. Hopefully she'll be back Thur night. Actually, Columbus could get canceled, so we might see her tomorrow night or Wed am. That would be great since I leave Sun night for Seattle for 2.5 days. Up north, swimming at the indoor pool/water park, selling girl scout cookies in the early evening, and then snuggling up to watch some TV tonight when everyone else was gone. A good Daddy/daughter day. My new iPhone 4 came and I was looking to reset things up this morning. One of the things that I noticed right away was that my ringtones had changed, so I got back to my default of “Low” by Flo Rida. However I wanted a touch more variety, so I quickly made a few more. Right click the song and select “Create AAC Version”. This should dupe your song. Go back and fix the first song, resetting the start and end times. I just uncheck the boxes. Select the new song and click “Delete” to remove the new song from iTunes. Select “Keep Files” and not “Recycle Bin” when it asks. Go to the file in Explorer (Music/iTunes/iTunesMedia/Music) and find your song. If you don’t show extensions in Explorer, fix that. Rename the song to whatever name you have with a .m4r extension instead of .m4a. Do this one song at a time so you don’t forget what you’ve moved around. That’s it, and you’ll have ringtones the next time you sync. For me, I made tones for “Crazy Train” by Ozzy (heard that one someone else’s phone), Telephone by Lady Gaga, The Real Slim Shady by Eminem (For Delaney), OMG from Usher (Tia), and Remember the Name from Fort Minor. 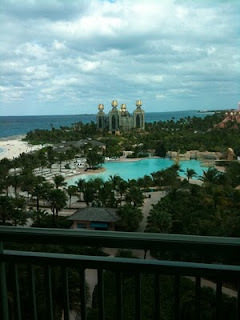 Vacation was great, the Bahamas beautiful, but I am glad to be back home. It was nice to see the kids last night and then sleep in my own bed. And wake up in my own sheets, next to my lovely wife. It’s like Outbreak meets The Stand. I picked this up as one that was recommended to my on Amazon, and wasn’t sure how it would go. Immortality starts out like a disease thriller, almost like Robin Cook. The book jumps around some “kill zones”, places where people seem to be dropping dead without cause. The CDC researcher suspects a chemical of some sort, but as we slowly move through the beginning of the book, and more incidents appear, it seems like we might have some strange new disease. When it appears the the reason people are dying is precision cuts to nerves that control breathing and heartbeat, it gets confusing. The Stand reference comes as some people seem to survive without reason while others are killed near them. As the book progresses, and it’s a long one, it seems like there is some other force at work. Not supernatural, but almost alien. It’s a fascinating story, and the more I read, the more hooked I was. It does make me think about the damage we do to the world as humans, and how we might be destroying our planet and have to deal with it at some point. This was exciting, and worth reading. Definitely worth the $3 price. Tia was up early, with a work meeting, and me not far behind. Our plan was to relax a bit by the pool, maybe swim, maybe walk to town. Tia had her laptop, thinking she might work a bit. Having done some MCM studying while she was in meeting, I was similarly motivated and took the iPad to the pool. We sat down there, ordered some food and a few drinks and didn’t do much. I listened to a Spatial data video, picking up a few things, and read a bit. I thought we might swim, but it was windy, and chilly. We actually cut the afternoon short, coming up to lie in bed, watch some TV and read because it was cold with the wind howling today. Felt like a windy day at the ranch. A nice run in the late afternoon and the plan is a nice, quiet, romantic dinner for two this evening. Here’s a shot from yesterday, sitting and relaxing on the beach. It looks like a Corona commercial. Our activity for the day was swimming with dolphins after lunch. So after a lazy morning, a late breakfast and a half hour laying on the beach with a cup of Starbucks, we headed over to the Dolphin Cay, an inland dolphin area on the resort. I wasn't sure what to expect, and wasn't sure I'd like it, but it was free, so we decided to try it. We changed into wetsuits, and dropped all our jewelry in a locker. We then went out with groups to the pool, which had a 2-3ft depth area circling the pool, which was easily 30 ft deep. Dolphins were all over, and our first exercise was laying on a boogie board, feet straight out behind us, and then a dolphin would come up, put its snout in our foot and push. We should get pushed across the pool, moving easily at 15-20mph. Pretty amazing. We got portable swimmer fans devices, which would pull us through the water. Not fast, but we swam around, up and down, with a dolphin following us and moving close. It was amazing to be that close and touch them. We finished with a hug and kiss from them, and got some pictures that I should get a copy of later tonight. A very cool day, and one we'll have to let the kids experience at some point. An excellent, relaxing day. 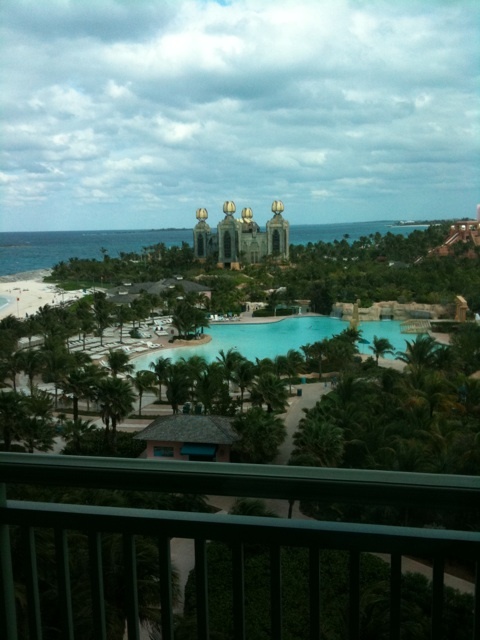 Reading by the pool, wandering around taking pictures of the Atlantis resort and then a run across the bridges back to Nassau and back. The main hotel, looking back from near the beach. One of the slides, with a clear tube that runs through a shark tank. No rides today, but at some point we'll have to go through there. Tia during her company activity, walking around on some scavenger hunt/team building activity. A nice relaxing day for us, no real work, and a great book to read. Tomorrow, swimming with dolphins. This place looks great. The view above is from our balcony. My talk went well in the Springs, and I left early to get back. A good thing since Delaney's ACT was 4 hours, and Tia was running late. I pulled buckets for her and threw 20+ hay bales into a stack on the floor for the nanny and just banged out a run. Now a shower, and a drive to the airport. So begins another whirlwind day in my life. It’s starting at 6am at the ranch outside Denver. Hopefully it will all end well in Orlando tonight. But first, a trip to Colorado Springs to speak at SQL Saturday #66, while Delaney takes his ACT test today. Then with luck, a run and a first class seat on the way to Orlando in the late afternoon next to my lovely wife. That’s two vehicles I’ve gotten stuck in the past two weeks. Last week it was Tia’s truck, sliding off the driveway after dropping Delaney off. Today it was the Prius. I was stopping to get the mail, on the phone, and not thinking. I slowed near the mailbox as I usually do to reach the mail and the Prius slid another foot. As soon as that happened, I knew I was stuck. I tried to reverse a bit, but no luck. Fortunately Tia was available and I called her to come get me out. She drove up and pulled the Prius loose with her truck. Getting ready to leave on vacation, without the kids, for a week, is stressful. Trying to ensure everything is set for home and work is hard enough. Add in the fact that I have to go to Colorado Springs tomorrow morning to speak before our flight, and Delaney has ACTs, and it’s more stressful. Add in that I planned on having a friend from Utah stay with me tonight and go to the event tomorrow, and it’s really stressful. I was managing, really doing well. I knocked out a bunch of work this morning. I was trying to hurry, and felt my neck tightening up. But I got most of what I wanted to finish today and got all my newsletters scheduled for the next week. I ran at lunch, did a little more work in the afternoon, and then headed to the airport a little early to pick up a friend. I got there right about the time I expected him to pick up his bags. I called him, and he said he was already waiting outside. So I walked outside and looked. No friend. We talked about landmarks, trying to fix the location and all of a sudden I realized he was in Colorado Springs at that airport. And I was at the Denver airport. It never occurred to me that anyone would fly to an airport other than the Denver one. I’ve never done it, and didn’t even really consider the Springs as an option. So I headed home, both of us making calls to arrange for him to get out of the airport, and then try to figure out what to do. He was supposed to be here, and still might be. We’ll see if someone can bring him back this direction and I’ll meet them. At least I got everything packed. 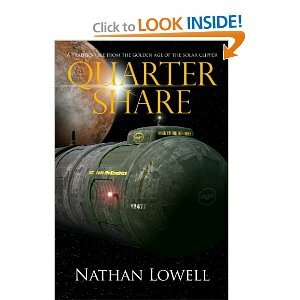 I grabbed a sample of Quarter Share, not sure that I really wanted to read the story, but I found myself fascinated after a couple slow chapters. It's somewhat based on the Clipper age of trade on Earth, but in this case a kid needs a job. His mother dies at the beginning, and living on a corporate planet, he has 90 days to find work or vacate the planet. Unsure of what to do, he signs on to a freighter, lucky to get a job as a cook's assistant. He impresses the old cook with his attention to detail and problem solving ability right away, but he is a kid. No experience and not a lot of confidence. However that soon changes as he does well in his job and even inspires others around him to change. He begins trading on the side, which is allowed, and has a tremendous amount of success. The book is well written, and guides you through what should be a slow time in space, weeks between ports, with the development of Ismael, he main character as he grows and makes friends in the crew. I couldn't put this one down and actually bought the next book as soon as I was finished. 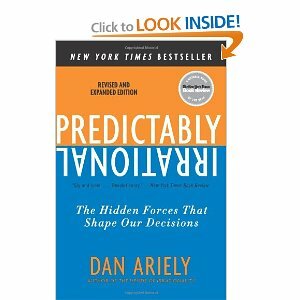 I picked up Predictably Irrational on a recommendation from a speaker a few months ago and while it started slow, it grabbed my interest and really made me think. The book is written by an MIT professor that suspects that the "rational man", the basis for much of economic theory, is in fact, not true. He presents an interesting case, in a variety of ways in which we make economic decisions, have social interactions, and even our honesty can change depending on circumstances. At times I felt their low cost experiments, many of which were based on college students' behavior, were simplistic, and not necessarily applicable to the rest of society. However the more I read it, and thought about the results and the implications of extrapolating the data, the more I think that this book does help to understand why the rational man might not be a good model for behavior. I don't know that you can apply the results to all situations, but you can use the results to understand why someone might not behave in their own self-interest. And how you might find yourself influenced by the initial price you see, the setting, or some other factor. I don't know if I can change my behaviors, but I think I might be more aware of them after reading this book. It's definitely one that will stick with me for a long time. I’ve been debating over what phone to switch to for a few months. Today I ordered an iPhone 4 from Verizon, starting the porting process, which should take about 10-12 days. The Verizon iPhone rumors, ever since October, have had me interested. Not so much because of the iPhone, but because of the coverage. Both Spring and Verizon have good service out here, and both TMobile and ATT don’t. So I wanted to make a switch and have been debating, and reading about the iPhone v Android and trying to decide. Ultimately, as I was on the phone with my business partner today, I just decided to get the iPhone. The 4G service was tempting, but as I consider it, it seems that there isn’t a lot of time when I’d be in a 4G service area. When I travel it’s likely, but 90% of the time I’m in Parker, and no 4G. Add to the fact that there’s a 4G surcharge likely coming, I decided to stick with the iPhone. Plus I like the iPhone. I went for a massage today and when the guy asked if I’d like my foot massaged, I said sure. However once he started to work on my left foot, I realized that it was a mistake. He didn’t do much, and I stopped him from pressing too hard, but it was too late. He tweaked my foot nicely. It’s achey, and sore, and while I’m sure it will be better tomorrow, it has my slightly concerned. The last year at karate I’ve tried to massage it and work it a bit before class, and each time I’ve realized that there is something wrong with my foot by my big toe. As I try to stretch my toe back and forth, it aches. I’m not quite sure what’s wrong, and it doesn’t bother me when running. It’s only an issue when I stretch it. One more thing to keep an eye on it and see what happens over time. And also try to see if I can slowly work it back into a strong place for karate. except us typing to pay for the house. Especially the cat, who decided to snuggle up on my lap for her mid-morning nap, after waking up from her nap while I drop the kids at school and before her lunchtime nap. Saw this parked up at the gas station near my house as I filled up in the snow. Not sure how practical it is, or if it’s really needed. I’d suspect that for what Tia and I may tow someday, an F-350/RAM3500 or maybe an F-450 will do fine. Still, it looks like a real truck, more impressive than most pickups. We leave Saturday for the Bahamas, and based on our last trip, we don't be able to buy ebooks when we're there. I had a few books for our last trip, but Tia wanted to buy some new ones while we were in St Marteen, but the downloads wouldn't work outside the US. I know that Amazon has expanded things and moved the Kindle overseas, but I wouldn't count on it working. So I decided to browse through the free books on Amazon's ebook list. I've gotten some good ones off there that later have been paid for books. Not that I mind paying for entertainment, but if I can try some new authors for free, I want to to give it a try. I grabbed 10 or 12 free books and 5 or 6 low-cost, $1-5 books from various authors. Some I know, some I don't, but they're bargains. I was hoping that the latest Vince Flynn had come down in price, but the ebook is still $14.99, so I'll forgo the read for now. I have seen some half-assed writing and editing the last year from some large authors, so I am not looking to spend a lot on books at this point if they're not likely to be good, and I certainly don't want to pay a premium. A semi-normal day after a few weeks of craziness. The weather, travel, etc., and it was nice to have a normal day. Tia got Delaney up, so I could sleep in and get Kendall to school and then get on with my day. No plowing, nothing weird today. The only thing that did come up was the tractor parked behind the Prius. I plugged it in this morning so it would start up later. At -5F early this morning, I needed something to help that diesel tractor get going. 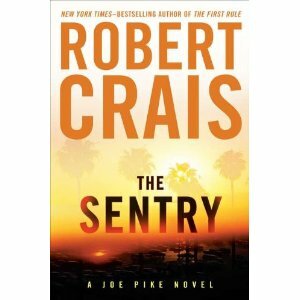 I was going to wait and not buy The Sentry until the price came down. However with a gift certificate given to me, and a trip planned, I decided to grab the book. I have really enjoyed the Elvis Cole/Joe Pike series, and was looking forward to another Joe Pike book. This one starts out with Pike witnessing a few suspicious men, and the beating of one of them. He stops them and calls the police, to the dismay of the shop owner and his niece. Pike operates by feel and thinks there is more to this and he thinks. The niece gets to know Pike and when she and her uncle disappear, Pike needs to investigate to find out what happened. Caught between the police who don't like Pike and want to suspect him, and Cole who thinks there is something wrong with the situation, Joe continues to drive forward. It feels a little more rushed, and it was written with less depth than some of the other books. However it's enjoyable and we get a little more insight into the character of Joe Pike, who has many of the strong, confident qualities that I think many of us wish we had. It snowed a little, with lots of wind last night. This morning schools were delayed an hour, which was good for sleep, but I didn’t take advantage of the time. I was tempted to go run the tractor up and down the driveway, but didn’t. Fortunately it was on the way back from dropping Delaney at the bus and not the way there. It was a little hairy getting out of our driveway, but we made it. The bus came, and then it stopped. The street it turns down after picking Delaney up had a truck stuck there and so the bus had to back up and go back the way it came. Not sure what the kids down that road did, but I suspect they had a day off from school. I made it back to our driveway, down and started back up when the Ford just slipped off the left side of the driveway. It was a weird place, and it was nicely stuck with snow up to the bottom of the driver’s side door. I climbed out the other side and luckily only had a 200ft walk to the house. Fortunately the tractor started, and I left it to warm up and then told Tia I’d need help. A little plowing and shoveling and the truck easily came out of the ditch. We left it running and then I took Kendall to school, making it there fairly easily. Once again it was a little hard to get back through our driveway, but I made it. Now I need to plow the driveway again, but I’m waiting to see if it warms a little and get some work done. It’s great to be back home, though I was hoping for a little less snow at the ranch. Weather was supposed to be good while I was gone, but it wasn’t, with snow coming down all weekend. As I drove out of the suburbs, the main road was a sheet of ice last night, slowing me down enough that Tia called to be sure I was OK. When I got into our neighbordhood, there was snow piled up, and I think I did the Prius toboggan down our road and driveway more than I drove. It really felt like I had little control, and I was really glad I wasn’t in the Porsche. Not sure I could have gotten it home. I've never been to Cleveland. Actually, I'm not even sure where I am right now. The mini map I got for SQL Saturday #60 showed the edge of a large lake near the city, buy it didn't click it was a Great Lake until the plane flew by an expanse of semi-frozen water, as far as the eye can see. The section of the city I'm in, outside Cleveland proper, looks like a New England town. Old houses, large lots, closer to 1 acre then a .5 acre. Lots of snow on the ground, narrower streets than Denver, and just a different feel. I met some friends, actually more than expected, and we hit a bar near the hotel for a drink, then went to the speaker dinner and had a great conversation with new, and old, friends over dinner. It seems that I always seem to find one person, often a new, and unexpected person, and have a memorable conversation. Tonight it was more philosophy and life, mixed in with some database design, but a good talk that made me think. Now I'm ready for bed. Even though it's early, Denver time, I have a long day ahead of me tomorrow. When I headed out to lunch with a friend today, it was about 25F. That's about 30-40 degrees more than it's been the last few days and I was thinking that it would feel warmer. I felt cold, and have been a little cold all day. I really need a hot shower, and to snuggle up in bed on this night off. No real work, other than I need to pack for a trip to Cleveland tomorrow. Cold is cold, and while I know that my fingers got much colder quicker the last few days, the snow coming down today, higher humidity, and still below freezing made it still feel cold. I met a guy from last year's baseball team for lunch today and paid my dues for baseball this season. We have a new manager, or maybe two, and I think that's good. I signed up with the intention that I'll make most games, but likely will miss a few for work. I'm getting excited, after not really thinking about it a lot since August. I was wondering how my back would feel as it was sore last year near the end of the season. Right now things are good, but I'm tempted to sit out some games, and only play the field, not bat. As I think about it, I really like fielding more, and I'd trade a batting order slot to get to play first or third all game. Funny, I never thought I'd say that and look forward to batting, but life changes you. Tia wanted to go get breakfast yesterday. We went to dinner Friday night, with the little kids having sleepovers, and talked about getting breakfast together at The Egg and I. She really likes it, and going down there, having some time with each other, letting someone else prepare food, is a nice break. We used to do this when we had one kid, but it’s been a long time since we’ve taken the time to do it. If we stay home, we tend to start get busy with other things and can’t focus on just enjoying each other. so we headed down to The Egg and I for the second time in as many weekends. This was another great chance for us to get time together after our ski day Friday got moved. The plan was that we’d go Monday, but we can’t ever really get too many quiet times together. We sat there, talking about life, about our plans for the future, what we wanted to do. It’s a mix of life, plans, financial planning, college discussions, work, and more. We’ve been debating about what changes we want to make in life, and one of those things was Tia’s truck. She has been wanting to get a nicer truck for some time, and has her eye on a Mega Cab Dodge that adds a lot of room in the backseat. She wants leather seats, and more upscale ride. I can understand that, especially as she makes some long trips in her truck. Not often, but hauling horses, she wants something nice. She also felt the backseat was crowded for the kids, however I don’t think that’s a good reason to buy a new truck. I know the kids want to be comfortable, but that’s a lot of $$$ for comfort, and it’s not like they ride in horrible conditions. Suffering a little on those trips is good for them, and it will build some memories and character for them, in my mind. However as we’ve been talking, she does want to get something nicer for her, and so we talked about different trucks. She wanted to see a Silverado, which seems to get good ratings. There was a local dealer, non-manufacturer affiliated, and recommended by a few friends. So we swung by there and looked at a few different types of trucks. We started looking at Chevy’s and Dodge’s that were on the lot. No Mega Cab, but there were lots of 3/4 and 1 ton trucks. We sat in the back seats of a number of them, comparing sizes and features. The guy was a good salesman, and as we talked with him, he asked a lot of questions and looked at what we wanted. Ultimately his recommendation was that we fix up Tia’s Dodge. He gave us some names of places that would re-upholster her seats in leather, give her some other upgrades, and make the Dodge a better truck. The company, Berkenkotter Motors, only sells vehicles under $20k, so they tend to have older models, but a nice selection, and good prices. We left, thinking about what we wanted to do. We drove home, talking about it, and ended up deciding to go back and look at the King Ranch Ford F-350. As we talked, Tia started to think that a Ford wasn’t a bad truck, and this one was a good deal, leather, and nice looking. It actually has 4 captains chairs, which means we can’t carry the whole family, but we thought it was nice and we could always buy a bench seat and install it. It had a great look of a buckskin style leather, and was a 350, so she would be able to tow whatever she wanted. Add in a DVD player installed and a sunroof, and it was really everything she wanted. So we drove back, drove the car around, and decided to buy it. We spent the rest of the day getting the paperwork straight, and her truck traded in. We got less for it than we could have, which is standard. But as we talked about it, we’re both too busy to take the time to sell it, and so we can live with that. So she has a new truck. The first Ford we’ve had, and it’s a nice birthday present for her. Now we need to add running boards, a soft top in the back, and a new stereo and she’ll be in great shape. Yep, I definitely found the frozen pipe. I’m sure of it because I had water spraying in my face. Fortunately it wasn’t a lot of water and a plumber is supposed to come in a few hours. I posted a note on Twitter as I was heading to town and a friend sent me a note that he had to thaw pipes a few weeks ago in Utah and used a heat gun. He sent me a picture, and it was the same type of gun I got years ago to strip off old paint. So after picking up some pipe cable and insulation from Home Depot, I went downstairs and started using the heat gun on low. The water comes in from the well about waist high, maybe a little lower, on the west wall. I walked over there, plugged in my heat gun and started to thaw things while on the phone with my business partner. I was worried the frost line had lowered because of the extreme temperatures, and we might have a frozen pipe in the ground. This pipe heated up pretty well, warming fairly quickly and then not cooling too much when I removed the gun. It was then I wondered if we might have the pipe frozen in the basement. It’s a walk-out, but this end is below grade. We don’t have it heated, but it doesn’t feel too cold in there most of the time. So I got the stepladder and moved on. The pipe runs up this well to the frame ceiling, about 8ft or so up. There is just framing, no drywall, but the pipe runs along the top of this wall for about 15 feet before turning into the middle of the basement and running to the center where the pressure tank, furnace, etc. are. It’s exposed pipe, but as I said, I don’t think the basement is freezing. While I was working along the pipe, starting from where it bends into the middle back, I noticed there was a draft. Since this part of the wall is behind the garage, it’s essentially an exposed outside wall. And apparently not well insulated. I could barely warm the pipe, unlike the pipe above that comes in from outside. So there’s a draft blowing on a 10-12 foot section of pipe. I did a few sections, working my way back towards the north. I set up near where the top of the pipe comes in above, ready to do the last 3-4 feet and see. As the image below shows, this is where it was frozen, and also where the copper had broken. As you can see above, I was working above these boxes of books (maybe ruined) while I was also on the phone. I was running the gun back and forth when I heard water release. The small bit of elation I felt from getting the water moving was tempered by a small spray of water in the face. Immediately I knew the pipe had broken and cursed a few times on the phone as I got down and started running across the basement. Andy asked me what was wrong and I told him the pipe was broken and I’d found the frozen part. He chuckled as I went outside and shut off the well breaker, having gone through similar home repair issues in Florida. It wasn’t a ton of water, and didn’t make a huge mess on the floor. Some had start running out of this corner of the basement, and I yelled for Delaney to grab towels and Tia to call a plumber while I moved some of the boxes out of the way. Delaney brought my almost all our towels, and I got things cleaned up while Tia tracked down a plumber that could come out tonight. I feel semi-handy in that I saved some plumber time and figured out what was wrong. I’m also glad that the pipe wasn’t frozen in the ground. Tia told me that while I was doing this, she’d been to the barn and found the water working there and had filled up the horses’ tanks. So we’re still without water, but not likely for too much longer. We also have the chance now to get a valve installed that will let us separate the house from the barn, allowing us to keep water out there if we have issues in the house. I’d like a valve somewhere outside, but I’ll probably have to dig up the well pipes again to get one out there. Not sure that’s something I want to do. Maybe if we have plumbing work done outside it is worth it. Now we need the pipe replaced, the new one insulated, and also some insulation in that part of the basement to try and keep the house warmer. At least the coldest day in CO in the eleven or twelve years we’ve been here. The kids are off from school, which was cancelled yesterday afternoon in anticipation. The news called it a “wind chill day” instead of a “snow day”. They were joking, but also warning people to stay inside. I agree, and couldn’t get closer for this picture. Luckily there’s no wind, because in the shade on the back porch, this says about -16F. The sensor on the chimney says -14 in the house, and that’s at 9:30am. Tia says it was -20 when she first got up. It’s supposed to move through quickly, so it should start warming up. Lucky there’s no wind, and not much snow. This could have been a nasty storm.